Possibly the Most Awesome Hose and Fittings Shop in the Entire World! We’ve separated our high pressure hydraulic hose and fittings from our regular catalogues because they tend to be a section all on their own in terms of purpose and application. 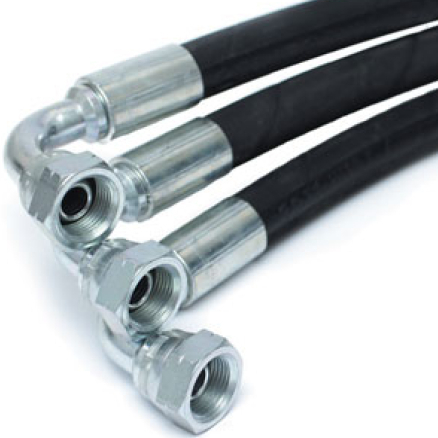 Hose commonly stocked and featured in this section includes; one wire, two wire, thermoplastic, sewer jetting hose, ‘true bore’ stainless braided teflon, fabric covered FC300 and R5, multispiral, megaspiral, megatech and pressure wash hose. Our crimp and field attachable (re-usable) style fittings follow closely after the hose products. Please note that when pairing ends with hydraulic hose it is very important to choose the right ends in terms of style AND brand; mis-matching hose and ends can cause failure and void warranty. Working alongside this section are Air Conditioning hose and fittings, push-on style hosetail connections and hydraulic steel threaded adaptors in as many styles and sizes as we could fit in! Last but not least is our range of metric threaded steel compression fittings to suit hydraulic tube. There are hundreds of different hydraulic fitting options (we’ve only included the most common in our catalogue) so if you don’t see what you’re looking for we can normally source it for you, including stainless steel requirements. Please contact us and we will be happy to discuss your options.